Without doubt, the Markowitz (1952) mean-variance portfolio theory is a cornerstone of modern financial theory. This section illustrates the use of the mean_variance_portfolio class to implement this approach. We start by instantiating a market environment object which in particular contains a list of ticker symbols in which we are interested in. Using pandas under the hood, the class retrieves historial stock price data from either Yahoo! Finance of Google. Since no portfolio weights have been provided, the class defaults to equal weights. Given these weights you can calculate the portfolio return via the method get_portfolio_return. Analogously, you can call get_portfolio_variance to get the historical portfolio variance. The class also has a neatly printable string representation. # ret. con. is "return contribution"
symbol | weight | ret. con. Via the method set_weights the weights of the single portfolio components can be adjusted. You cal also easily check results for different weights with changing the attribute values of an object. 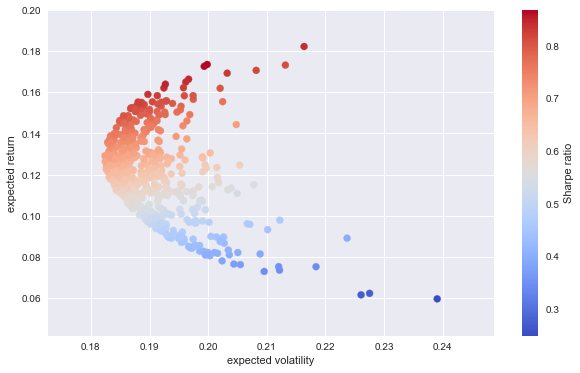 Let us implement a Monte Carlo simulation over potential portfolio weights. And the simulation results visualized. One of the major application areas of the mean-variance portfolio theory and therewith of this DX Analytics class it the optimization of the portfolio composition. Different target functions can be used to this end. The first target function might be the portfolio return. … or just a an upper bound (“inequality constraint”). The class also allows you to minimize portfolio risk. And, as before, to set constraints (in this case) for the target return level. Often, the target of the portfolio optimization efforts is the so called Sharpe ratio. 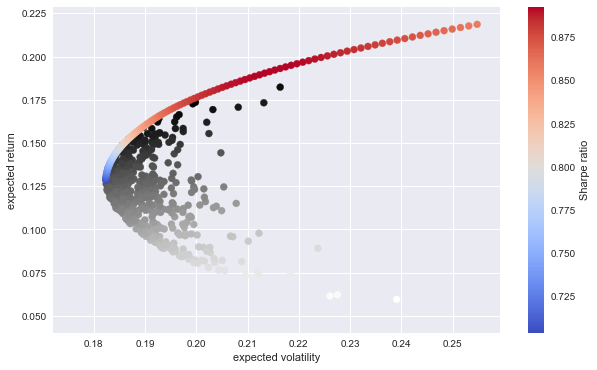 The mean_variance_portfolio class of DX Analytics assumes a risk-free rate of zero in this context. Another application area is to derive the efficient frontier in the mean-variance space. These are all these portfolios for which there is no portfolio with both lower risk and higher return. The method get_efficient_frontier yields the desired results. The plot with the random and efficient portfolios. 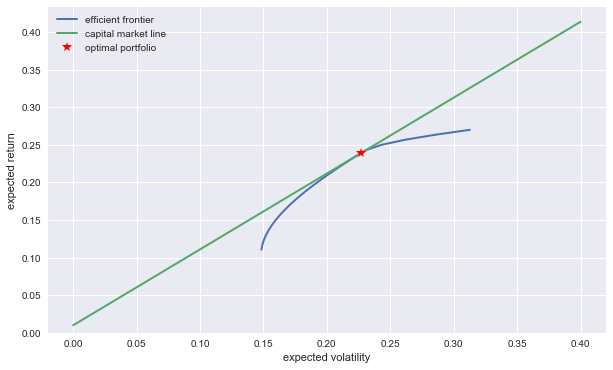 The capital market line is another key element of the mean-variance portfolio approach representing all those risk-return combinations (in mean-variance space) that are possible to form from a risk-less money market account and the market portfolio (or another appropriate substitute efficient portfolio). 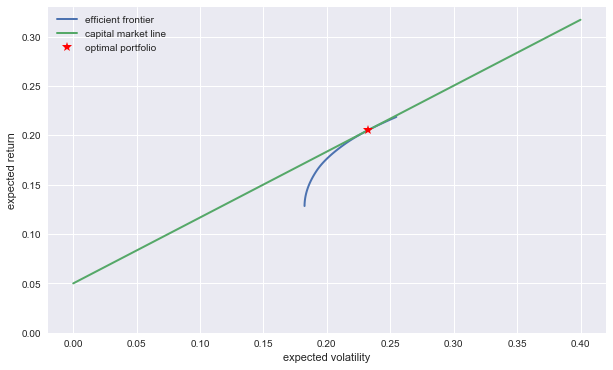 The following plot illustrates that the capital market line has an ordinate value equal to the risk-free rate (the safe return of the money market account) and is tangent to the efficient frontier. The portfolio composition can be derived as follows. Or also in this way. As a larger, more realistic example, consider a larger set of assets. Data retrieval in this case takes a bit. … and capital market line derivations take also longer.